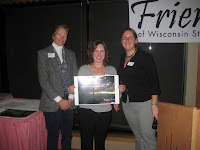 This Summer, all state park and trail visitors were invited to submit their favorite photo or photos for a 2009 Friends of Wisconsin State Parks calendar. The theme of the photos were seasonal. 12 winners were selected for each month of the calendar. The deadline for all submissions and voting was Sept. 19, 2008. On Friday, November 7, 2008, over 100 FWSP members and supporters met for dinner and an awards banquet at the House on the Rock Resort in Spring Green, WI. After mingling and dinner, awards were given for the 2008 Gold Seal Awards and the 2009 FWSP Calendar Photo Contest. Watch for future announcement regarding Calendar availability.! Anyone interested in sharing photos of Wyalusing State Park? As I look out of the window, composing this paragraph, a cold shiver runs up and down my spine. Cold, wet rain, just on the verge of snow, bounces off the window pane. Looking at Sara's photo brings back fond memories of Wyalusing State Park. Wyalusing State Park offers beautiful vistas and quiet spots during all seasons! Maybe members of Friends of Wyalusing State Park would be willing to share photos of the park showing all of the seasons. How about it? Anybody interested? Consider this a poll. It would be great if we could have enough photos to have our very own calendar. If you can not see the above form or if it doesn't seem to work click here. Regular meetings are held on the second Monday of the month. This past year it has been rough on hikers coming to Wyalusing State Park. Several of the trails in the park received extensive damage from the flooding of July 2007. Many of the trails were completely destroyed. Over this past year a significant amount of planning has been done to figure how best to rehabilitate the destroyed trails. The main goal of this planning was to create hiking trails that were sustainable. There are several factors to consider when designing sustainable trails including, soil types, rainfall topography, type of uses allowed on the trail, and level of development. The goal of sustainable trails is to protect the environment, meet the needs of its users, minimize user conflicts, minimize any future maintenance, and create a trail that will hold up better to major storm events. Currently, Sugar Maple Nature Trail is under construction at Wyalusing State Park. The statewide trails crew, along with park staff have been working on the trail for the past month. They have completed approximately ½ of the trail. Those who have traveled the new trail sections have commented that they have enjoyed the hike and have especially enjoyed the scenery. The statewide trails crew will continue working into the fall as long as the weather allows. By Memorial Day of 2009 the Sugar Maple Nature Trail is expected to be completed and users will be able to make a continuous loop on the trail. After the completion of Sugar Maple Nature Trail, the statewide trails crew will start working on the Bluff Trail System. Over these next couple of years the statewide trails crew and park staff will be working hard in rehabilitating the trails at Wyalusing State Park. Not since the original construction of the trails in the park in the 1930’s and 1940’s has there been such a massive effort spent on the design and rehabilitation of the trails. It is our hope that users will continue to enjoy the improvements that are being made on the trails at Wyalusing State Park. The 2008 Gold Seal Award voting has been completed. 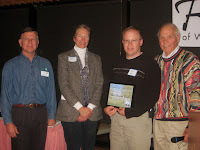 Wyalusing State Park won an awar d for the Best Birding Trail in Wisconsin.